January 2010. In the wake of Haiti’s devastating earthquake, millions of people are left displaced. Among them is a group of children — many disabled and without caretakers — situated within the General Hospital in Port-Au-Prince, whose lives are made even more vulnerable when the disaster inflicts damage upon their ward. With thousands of severely injured citizens pouring into the undersupplied facility, the already-overwhelmed hospital staff is unable to provide these children with the appropriate level of care that they need. It’s evident something must be done… and fast. Upon the request of the Haitian Government, Harvard-based doctor and anthropologist Paul Farmer, along with human rights activist Loune Viaud — both of the non-profit organization Partners in Health, which aims to provide high-quality healthcare in settings of poverty — immediately come to their aid, transporting all the kids to a rural property in Croix-Du-Bouquets. Their effort eventually expands to incorporate a robust staff of caregivers, in addition to schooling, recreational activities, medical services and above all, a sense of ultimate safety and security. With this, they officially establish Zanmi Beni Children’s Home, now in its eighth year of commitment to “doing whatever it takes” in order to ensure the utmost quality of life for all the children it takes in. But while Zanmi Beni indeed continues to flourish as a service institution today, having doubled the number of children taken under its wing since its inception, with operating costs on the rise as its staff continues to build toward the future, it’s apparent this not-for-profit organization remains in great need of help. Enter three New York teens — Theo Dolan, Oscar Llodra, and Ella Stiller — in need of fulfilling a school community service requirement, with hopes of simultaneously leaving an indelible mark not only on their community, but on the world at large. Each with their own deep connection to the kids of Zanmi Beni (and given that Dolan and Stiller had even visited the site firsthand with their respective families), it seemed as if these two factions were destined to join forces. 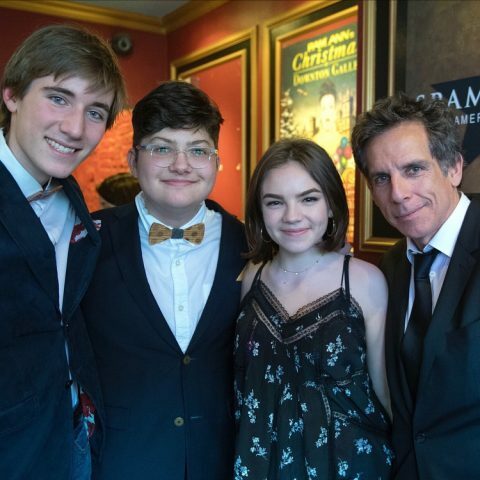 (L-R) “Broadway Hits for Haiti” producers Oscar Llodra, Theo Dolan & Ella Stiller with host Ben Stiller. Together, their efforts raised $25,000 for Zanmi Beni Children’s Home. The only question, of course, was: how? “We wanted to do something not only to make people aware of Zanmi Beni and what their [organization] does, but to [create] a space in which people can really think about community action…on a larger level,” Llodra explains. All strong believers in the idea that “music has the power to transport you out of your daily life [in order to] make you feel something bigger,” they decided unanimously, on Dolan’s recommendation, that the fundraiser take the form of a concert. And with a strong passion for the theatrical — and a host of Main Stem connections between them — they deemed the Broadway route, though an ambitious one, the most natural way to go. 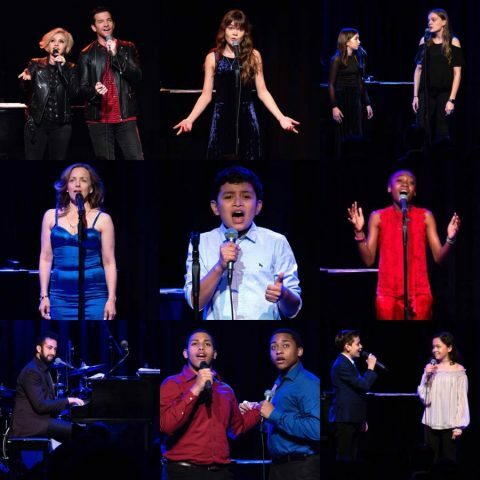 “The emphasis was not only on Broadway performers but on teen and child Broadway performers as well,” says Llodra, as a means of directly aligning themselves with the children they aimed to support. As such, Dolan enlisted younger sister Evie, a standout Katie Travis (the bass player) in the original cast of School of Rock: The Musical, who helped to assemble a formidable group of young Broadway talent, consisting of fellow Demon Rascals and other showbiz teens. Pooling their collective contacts together, the trio were able to nab additional big-named heavy hitters like Clarke Thorell, Jonathan Dokuchitz, Alice Ripley, and perennial power couple Orfeh and Andy Karl. Finally, through mutual friends, they were introduced to Triad Theatre owner Peter Martin, incidentally revealed to be an alum of their high school, who graciously secured them the venue for the evening. And with that, on April 28th at 5:00pm, the aptly-titled “Broadway Hits for Haiti” became a reality. For one, the feeling of communal support was palpable throughout the night, as joy and positivity emanated through the room with every song and speech. Thoughtfully chosen selections ranged from the silly to the sublime, all promoting messages of hope and perseverance as a means of inspiring change. But while the three producers (deservedly) revel in the success of the concert itself, not lost on them is the reality that their work has a genuine impact in altering lives – an element that only further fuels their advocacy for having young people stand up and speak out. While they’re not quite as young as the precocious little bookworm, there’s no question these three phenoms exemplified her statement to the fullest. In December 2014, Dolan and his younger sister, Evie, visited Zanmi Beni with their family. Here, we candidly quote each of them on the impact of their experiences. HERE’S TO THE MUSIC MAKERS! Accompanists for the “Broadway Hits for Haiti” benefit concert included Roy S. George, Steven Jamail, Raghav Mehrotra, and Julie Reumert. Broadway Hits for Haiti was presented on April 28th, 2018 at the Triad Theatre (158 W. 72nd Street) in New York, NY. For more information on Zamni Beni, including how to donate to the organization and/or “friend” a child, visit www.friendsofzb.org or text the phrase “Bway4Haiti” to 1-844-544-7171. 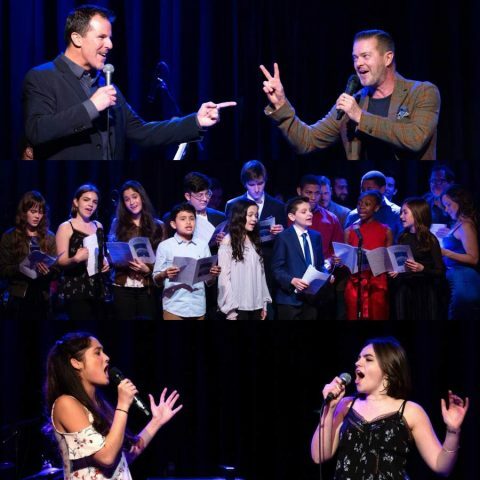 For more on the concert itself, follow @broadwayhitsforhaiti on Instagram.